Here I am before ‘The year of the cockerel’. Looking neat and tidy and also keeping a tidy rick of turf. During the years I lived in the west of Ireland, many animals came my way. Hen’s, goats, horses, ponies and dogs to name a few. And I learnt something from them all. Most lived out their natural life with me, but there were a few who didn’t. One that instantly comes to mind was a large and colorful cockerel of brilliant hue and savage temperament. He first arrived in the innocent guise of a helpless fluffy chick and thus fooled me completely. Being the only male in a clutch of females, his mother had probably spoiled him, causing his arrogance and though this saved him in his youth (the fox that got his mother and the rest of his siblings probably didn’t dare tackle him too) it was the undoing of him later. Initially he grew up like any unruly teenager, but I should’ve guessed by his arrogant gait and half strangled sounding crow as he strutted around the front garden that he spelled trouble. Unfortunately I didn’t recognise the signs. The cottage I was living in at the time, was up a long narrow lane, about two kilometres from the nearest village. It was a typical three roomed abode with an add on bathroom and kitchen out the back. The original thatch was long gone and a corrugated roof stood in its place. To the front lay a small lawn, dotted here and there with apple trees, (the very ones the goats in my previous tale attempted to climb) and beyond that a stand of conifers whose purpose was to act as a shelter belt. It was on the top of the tallest of these trees that ‘the bucko’ would roost, crowing at an unearthly hour and viewing his domain with a mean eye. To the right of the cottage was an open turf shed in which lay a heap of neatly stacked turf (my work) and an untidy pile of wood, some already chopped for kindling, some still awaiting the blow of the large axe which stood at the ready embedded in a block of timber. A clothesline, strung from one end of the shed to the other, was handy for hanging washing on on rainy days. Back towards the lane, another strip of grass with a second washing line, strung between two tall scots pines, ran. These tree’s with their tall red colored trunks were quite ancient and stately and I had placed a chair under one of them making it my favorite place to sit. For a while I lived peacefully there. The only sounds were the maa-ing of the goats, the bird song, the wind in the tree’s and the early morning call of the cockerel whose crow, I noted, grew louder and more raucous as he grew larger. Being new to the area and not knowing many people other than my sister, who lived a couple of kilometres away, I had few visitors and I spent my days happily reading, painting, writing, working to clear the garden and heading away on my bicycle to pick up essentials from the local shop. It was a halcyon life. Unfortunately these tranquil days were about to come to an abrupt end! One calm sunny day while stretching up to peg washing on the line, I caught a movement out of the corner of my eye. It was probably the recent development of extended peripheral vision and extra sensitivity to sudden movement I had gained, from being constantly in the company of goats, that saved me. I ducked just as the cockerel launched himself, spurs extended, at my head. As I did, I grabbed the long stick propping up the line and gave him an almighty thwack before abandoning my washing and running for the house. I heard him gather himself with a flurry of ruffled feathers as he prepared for a second attack but I had made it through the door just in time. In hindsight, maybe if I had stood my ground at that first attack, he might have learnt who was the boss and we could have continued to live together in a sort of unsettled truce. But I didn’t. Instead as I tried to catch my breath and still my beating heart, I peeked nervously out the window only to see him disdainfully picking up my underwear in his beak, tossing it into the air and trampling it in the grass. Then he strutted away fluffing and shaking out his colorful feathers before flying back up into the conifers. It was obviously his way of declaring war and I had already lost the first battle. From that moment on whenever I went outside, I carried a broom to defend myself. And while his method was to lie low and wait until my guard was down before attacking, mine was purely of defence. As the days passed every tree and shrub became an object of potential danger. (I never knew what he would be hiding behind) my beautiful scots pine was no longer a place to sit and relax under. My once favorite chair now lay desolate on its side (the result of a particularly fierce battle one afternoon) the grass growing up through its arms. I even kept my bicycle inside as it became one of his choice places to launch an attack from. He had cleverly recognised its strategic importance. After all without my bicycle I couldn’t cycle for more rations to keep my strength up. I still worked in the garden though as I always had a tool at hand. The sight of a hoe or rake or spade, prevented him from trying anything. Instead he would just perch on the gate, glaring at me, every now and then emitting an ear piercing crow which, like the baying of the hounds of the baskervilles, instilled cold fear into my soul and sent shivers down my spine. My garden began to suffer. Vegetables planted with stressed quaking hands do not flourish well. By now I was rapidly losing ground . His domain from apple tree outward was expanding whilst mine was ever retreating towards the house. Sometimes he chose to do battle in the open. Like a duel, with pistols at dawn, we would face each other. He armed with his beak and spurs , me with my broom. With glorious rainbow colored hackles raised and one wing spread wide, he would advance in a sideward movement, the spread wing sweeping the ground, dragging pieces of gravel with it, making a rattling machine gun like sound, while his small, mean, calculating eye remained fixed on mine. And I would stand, holding the handle of the broom firmly in both hands, taking the the stance of a samurai warrior and we would glare at each other for some time, neither of us breaking eye contact as the minutes ticking by. Other times he circled, forcing me to spin around which made so dizzy that when he did attack I could only flail my implement in windmill fashion giving the appearance of one being attacked by a swarm of bees. When the battle was starting into its third week my sister came to call. Pulling up at the door, she preceded to hop out of her little brown morris minor. ‘Watch out!’ I shouted. But too late! Himself had been lying in wait. ‘What the?..but before she had a chance to finish, he launched himself at her over the open car door. I pulled her inside to safety just in time. As we clutched each other, catching our breaths, she looked at me in horror. I glanced at myself in the mirror behind her. My normally rosy cheeks were pale and gaunt and streaked with grime. My eyes were red and wild. My hair looked as though I had been scrambling through a briar patch (I probably had). Sitting her down with a cup of tea, I told her my story. ‘What ridiculous nonsense!’ she said as I finished my tale. Two weeks! I couldn’t believe it. My days and nights had blended into one long nightmare. I had no idea of the passing of time. I hung my head in shame admitting that it was indeed ridiculous but she was no longer listening to me. Instead she leapt up off her chair, marched out the door and headed confidently towards the turf shed. There, she kicked aside a few clods of turf (my turf rick was no longer tidy as I often had to use the sods as hand ammunition) and pulling the axe out of its timber block, swung it over her head in one hand as she approached the cockerel, who was now lurking in an not so brazen manner behind the scots pine. I watched the evolving scene through the window, heart in mouth, fearing for her safety. But I needn’t have worried! He, sensing that he had met his match, took flight and half running, half flying, cleared the barb wire fence and took off across the fields, my sister after him. And that was last I ever saw of him. But the vision of the pair of them, silhouetted against the evening sky before disappearing over the brow of the far off hill, himself with his neck outstretched, wings flapping madly, my sister with the axe aloft, gaining ground, will be forever imprinted on my mind. Photo’s of me by Nutan. Seeing the ditch through the eyes of a rabbit. Rosibelle Moonshine in her heyday (now sadly pushing up daisies). It started it out with a goat. I hadn’t fully made my mind up, hadn’t said a final yes. In fact I distinctly remember my words being ‘let me think about it’. But the owners of the goats, one long haired and shaggy, the other missing half a horn (the goats that is, not the humans) were obviously desperate to get rid of them as they appeared later that day with the pair in the boot of their station wagon. Knowing that they had driven quite a distance and that one of the couple, being french, may not have have understood me correctly, I felt I couldn’t at this stage say no, so instead I stood there dumbly with a fixed smile as they swung open the door of the boot and set the occupants free. Non! They wouldn’t stay for tea. (They had some urgent business to attend to). Mais non! they wouldn’t take any payment! absolutment! wouldn’t hear of it! and they really had to be off. So I remained stuck to the ground choking and spluttering as the wheels of their rusty vehicle churned up the dust on the laneway and they shot around the corner with the skill of a boy racer, the back door still swinging open. I heard the car stop in the distance and the slam of the door. (I also thought I heard some wild laughter but that may have been the wind whistling through the conifers). Meanwhile the pair wasted no time in attempting to scale a nearby apple tree stretching their scrawny hairy necks and nibbling at the fruit buds. Later I became very familiar with the extent of their climbing abilities but now, grabbing the collar of the less nimble, I noted with disappointment that they in no way resembled the sleek Saanens and Toggenburgs with large udders and gentle slope from hip bone to tail that promised good milkers (as shown in my goat husbandry book). My new acquisitions had kidded a few weeks before but with all that hair I couldn’t even catch a glimpse of udder, large or small. However all was not total despair and by the time spring had headed into summer and I had fed them well and brushed them daily, they had lost their rough scraggy hair to reveal a smooth summer undercoat and indeed began to look more like the beasts I had drooled over in my book. They even managed to give enough milk for the household, including the makings of soft cheese and yogurt. I began to form a positive relationship with them. They also formed a firm attachment to me and would come when called and I could let them into the lane to graze the briars knowing that they wouldn’t wander too far without me. The downside to this however was whenever they spotted me cycling to the shops they would give chase and no amount of shouting and waving of arms and, I am ashamed to admit, even the throwing of the odd stick at them, would make them change their minds. The gate at the end of our lane was no deterrent, they just scrambled up the bank and cleared it and the only hope I had of arriving in the village without looking like a modern day version of Heidi was to pray that the willow tree enroute, whose bark they could never resist, would keep them distracted until I was out of sight. The following year I decided to get the one who most resembling a pedigree in kid. Felix moonshine performed the honourable task. Two things happened because of this. Firstly I formed a wonderful friendship with the owners of felix which is still going strong a quarter of a century later and secondly as I cycled the laneways on those wet days collecting foodstuffs for the pair I began to see what grows in ditches through the eyes of a goat. I have read that goats can only see yellow, orange, blue, violet and green. They cannot see black and white so when down on my hands and knees pulling dandelion leaves and bunches of succulent vetch or reaching up to cut saplings of willows, rowan wild crab apple and ash or yanking couch grass and unravelling it though patches of thorny briars (a most accomplished and satisfying task) I began to lose touch with the human world and its black and whiteness. And as I cycled further into the countryside and the noise of traffic dwindled, I got the chance of sinking deliciously into the animal world of the textures, colors, scents and sounds. I have also heard that goats are extremely sensitive to movement and I began to note every beetle, tiny spider, and insect threading its way in this verdant world and tried not to gather them up as I went about my business of keeping my ladies producing the sweetest and most nutritious of milk. My journey to shops took longer and became weightier not because I was impeded by two loyal goats, (now that I had a goat shed I could put them in before I set off) but because I got distracted by the growings of the wayside. ‘Ginny would love that’ hopping off my bicycle at the sight of some crunchy wild borage and stuffing a bunch of it into my saddle bag. ‘Daffodil daisy would relish those’ I’d sigh with pleasure getting out my secateurs (never go anywhere without a good pair) and snipping off some willow branches and tying them to my back carrier. I became a goat human so much so that my goat friends gave me a present of beautiful REAL pedigree Saanen female kid. Rosibelle Moonshine became one of my herd and in the years that followed showed my pair a thing or two in the art of kidding and milk production. 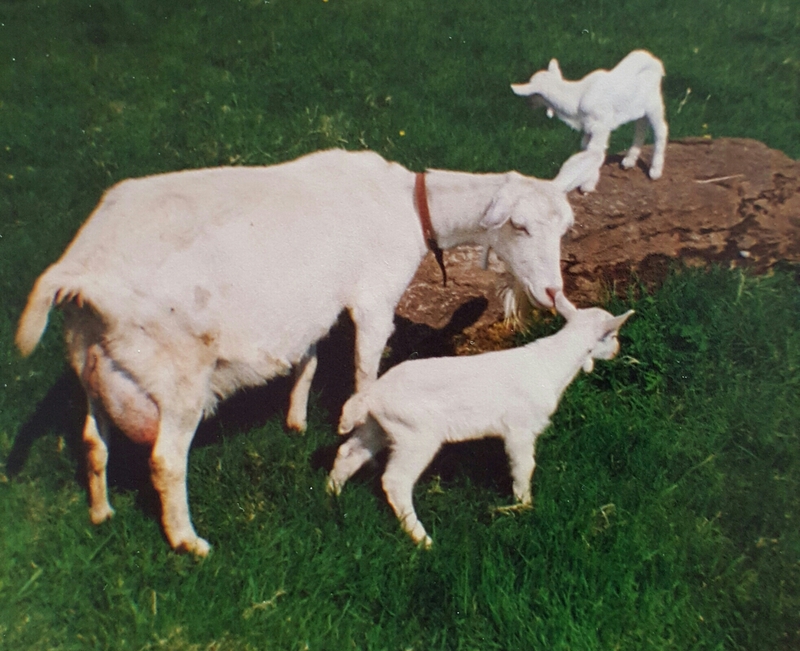 And the pair recognising royalty when they saw it showed no signs of jealousy at this interloper who went on to win champion goat of the show and produce further REAL pedigree british saanen kids for my expanding herd. Years passed, life changes when you are busy rooting in ditches. My goats are well pushing up their own daisies by now, but recently my daughter got two lop earred rabbits. 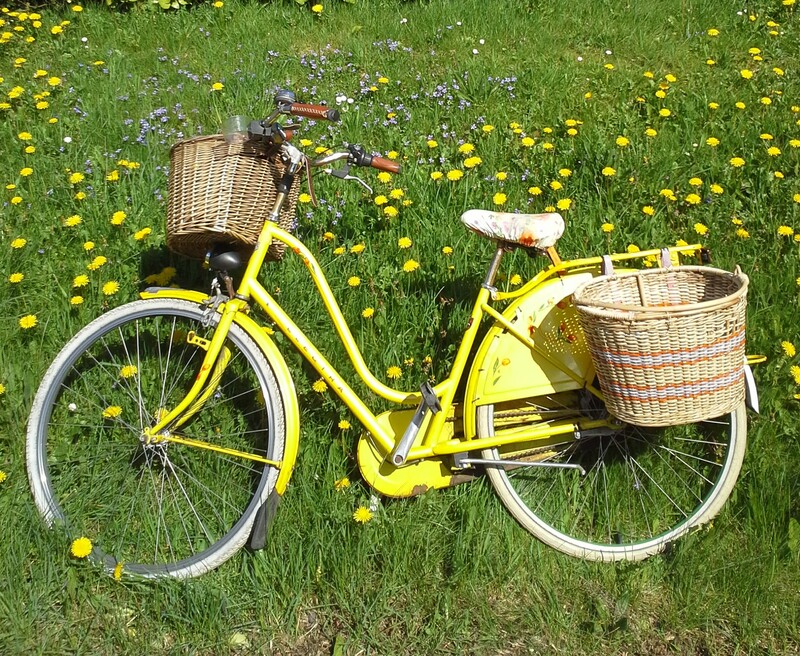 So I am off on this soft spring morning scouring the lanes of wicklow for succulent dandelion leaves. Yes I have begun to look at ditches through the eye’s of a rabbit.